Dr Makanga is the Chief Executive Officer of the European & Developing Countries Clinical Trials Partnership (EDCTP) Association’s Executive Secretariat. He is a clinician-scientist born and raised in Uganda with 25 years of professional experience working on health and poverty-related diseases in sub-Saharan Africa. This includes 21 years of work experience on medical product development and clinical regulatory activities. He holds a Medical Degree from Makerere University, Uganda, and has been in various clinical and research positions before and after undertaking a Master’s Degree at the University of Liverpool, and then a PhD at the Liverpool School of Tropical Medicine, United Kingdom. He is also a Fellow of the Royal College of Physicians of Edinburgh, Scotland. Before joining EDCTP he was first in clinical practice and academia, and later clinical research where he served as Head of Regulatory Clinical Trials Facility and Outpatient Clinic at the Kenya Medical Research Institute – Wellcome Trust Collaborative Centre, Kilifi, Kenya, under the auspices of the United Kingdom Universities of Liverpool and Oxford. Dr Makanga joined EDCTP in 2004, where he held various management positions. He was appointed as Director of South-South Cooperation and Head of EDCTP Africa Office in Cape Town, South Africa, in 2008. 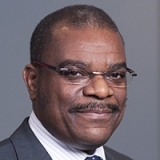 During his 12 years at EDCTP, Dr Makanga has built up significant experience in global health, research for health capacity development, quality assurance, project management and evaluation, health and research management as well as diplomacy and engagement with policy makers, health and regulatory authorities in sub-Saharan Africa and Europe. Moreover, he has served in various scientific and policy advisory boards for international product development and philanthropic organisations along with pharmaceutical companies involved in developing medicinal products for poverty related and neglected diseases. He is very proud of being able to contribute to the advancement of research and development of a new generation of scientists in Africa and Europe, as well as contributing to development of new medicines, vaccines, microbicides and diagnostics which are desperately needed in the fight against poverty related diseases affecting millions of lives in Africa. He aspires to contribute to advancement of research and innovation, especially through the new generation African scientists.